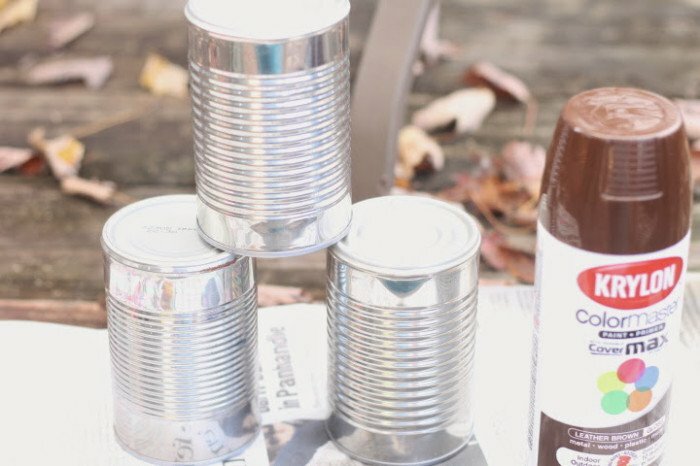 Did you catch our upcycled tin can Frankenstein? We had so much fun with them we decided to make one to deck the halls porch with. Free or practically free DIY’s are the best right? 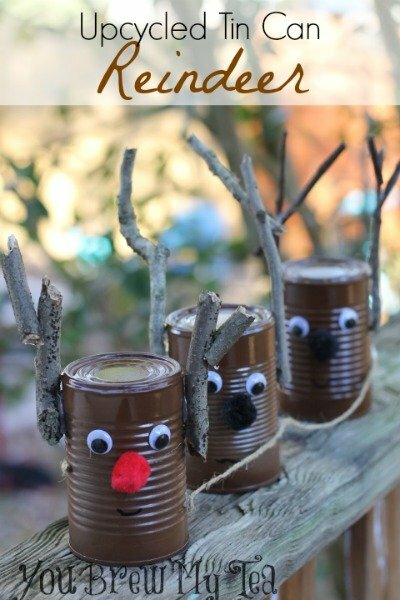 That is why we love this Upcycled Tin Can Reindeer! After you have gobbled up those green beans don’t toss out the can, hit it with a little spray paint and it can turn into hundreds of different things, lending a little cheer to your front porch. This time we created a few reindeer to keep an eye out for Santa. 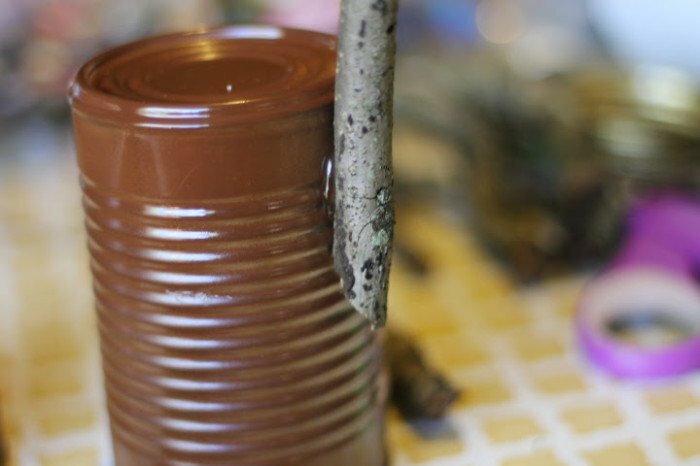 The beauty of this project is that it is so open- use any size cans you have on hand, make one or all 8 (Dasher, Dancer, Prancer, Vixen ,Comet, Cupid, Donner, Blitzen, and of course Rudolph). Go ahead and finish your can of pinto beans or mixed fruit, I’ll wait, then we can get started on this fun and festive DIY! Clean your cans well, dry thoroughly. Give them a quick wipe down with alcohol to remove oils and residue-this will prepare the surface a little better for paint. Spray cans lightly with a coat of brown paint, allow to dry for 5 minutes. Spray 1-2 additional times, waiting 5 minutes between each, until cans are well covered. Dry after final coat for 3-4 hours. Use hot glue to attach large googly eyes and pom pom noses. Draw on a mouth with paint pen. Now, for the antlers, head outside and find small limbs that have as many “branches” on them that you can find, you will need 2 for each reindeer you make. (if you cannot find any that have more than 2, just hot glue on a couple small ones to create the antlers. Secure them to the sides of the can with a generous amount of hot glue. Finally attach your reindeer together by gluing twine to their sides to act as the reigns. 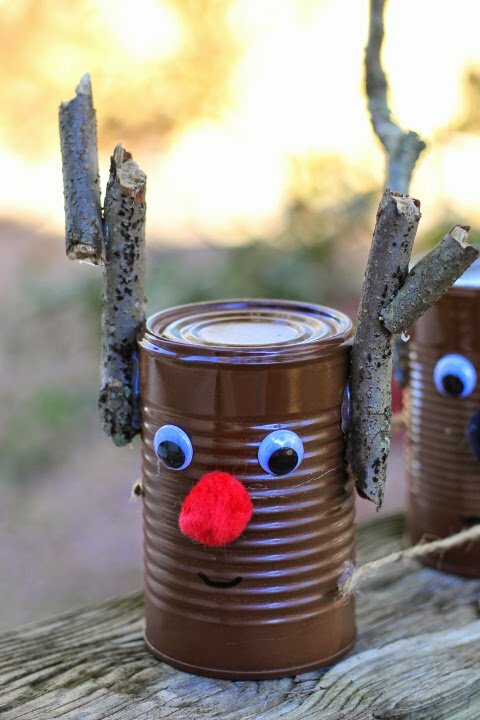 We know you love making fun upcycled crafts and gifts and this Upcycled Tin Can Reindeer is tons of fun! Not only is it simple to make, it can be personalized so simply with your favorite embellishments. Just throw a little name plaque by each reindeer and add a fun Santa to the mix for your own unique reindeer & sleigh themed decor! This one is easy enough the kids can help you out with it too! For more fun DIY and Upcycle craft projects check out some of our favorites below! This would be so much fun to do! I actually have a nice stash of tin cans since someone stole our recylce bin/trash can (yes, stole it, who does that????). This will be a fun indoor activity during our cold snap. Such a fun project for my kiddos to do. Thanks for the inspiration! I would love for you to share this post on my Show Me Saturday party. We are live now! My son is going to love these when he sees them. G’day How cute! All blog comments appreciated and sharing is caring today! Thanks so much for sharing this at the Say G’day Linky Party. I am featuring you this week! Cute idea! I love reindeer crafts! I’ll be sharing this on Think & Make Thursday tomorrow 🙂 Cheers!